Have you ever passed a house and wondered how much it’s worth? With the HomeSnap app (free in iTunes), finding out is as simple as taking a picture. 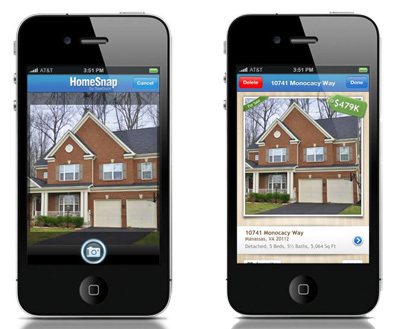 Using your iPhone’s GPS, HomeSnap identifies the home in your picture and brings up all the details. You can find out what it’s worth, when it last sold and for how much, how many bedrooms and bathrooms it has and how big the lot is. If the home is for sale, you’ll see the current list price, how long it’s been on the market and pictures of the interior. You can also schedule a showing with a real estate agent through HomeSnap. For serious home buyers, there are also on tax records, local school information, census demographic data and information on the neighborhood. Future MLS coverage is planned to cover the top 35 markets. An Android app is in the works. HomeSnap works nationwide - coverage includes over 90 million homes. In the 13 markets that you specified, HomeSnap is enhanced with MLS data. Thanks, Lou. We have corrected the story.